Pneumatic conveying systems market size is anticipated to exceed USD 30 billion by 2022, growing at over 5% from 2015 to 2022. Technology progression and innovation in numerous feeding technologies such as vibrating dosing screws, suction nozzles & hoppers, and rotary valves are expected to boost industry demand. Food industry was valued over USD 5.5 billion in 2014 and is estimated to exceed USD 8.5 billion by 2022. 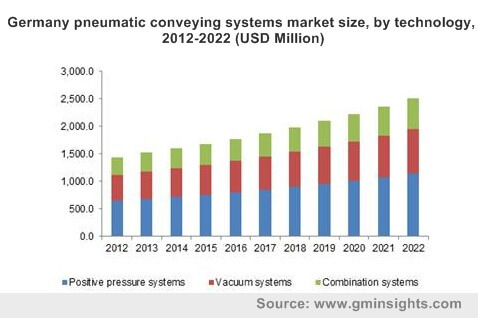 Integration of intelligent control technologies with compact pressure-vessel Rising demand for conveying systems is anticipated to drive pneumatic conveying systems market size. Furthermore, availability of highly developed filters allows uninterrupted conveying of fine dust irrespective of filter capacity is likely to boost the demand. Minimized production downtime, improved quality, increased productivity and cost savings are the various benefits offered by these systems. Increasing usage in end use sectors such as petrochemical, chemical, ceramic, food, rubber & plastic, waste water management, cement industry as well as pharmaceutical is anticipated to propel the industry growth. Pneumatic conveying systems market aids in preventing product contamination by eliminating dust particles present in the system. Hence, industry participants are now focusing on implementation on these systems in order to produce better products. Implementation of pneumatic conveying systems involves high capital investment owing to existence expensive system parts in the system. Certain material having high bulk density namely gravels and rocks are difficult to be conveyed. Sticky substances such as titanium dioxide have a tendency to produce coating on the contact surface and thus block the conveying line. The aforementioned factors are likely to hinder the industry growth. Pharmaceuticals and food industry are expected to furnish potential growth avenues owing to increasing application of these systems on production and processing sites. Dilute phase conveying systems market accounted for over 70% of the pneumatic conveying systems market share in 2014. It is likely to exhibit significant growth owing to its property of using only air pressure for conveying material. Dense phase was valued over USD 5 billion in 2014 and it is likely to grow at CAGR of over 5% from 2015 to 2022. It involves the usage of transporters such as blow and pressure tanks. Positive pressure system market was evaluated over USD 10 billion in 2014 and is expected to grow at a CAGR of over 5.5% from 2015 to 2022. The surge in demand for pneumatic conveying systems can be attributed to its capacity of conveying bulk materials from one source to multiple destinations. Vacuum systems segment accounted for more than 30% of the overall industry share in 2014. It is projected to exhibit considerable growth rates due to its growing implementations for light and free flowing materials. Pharmaceutical industry was valued over USD 5 billion in 2014 and is estimated to grow at a CAGR of over 5% from 2015 to 2022. The spur in the segment can be subjected to flourishing usage of these systems for staging, blending, granulation, compression, coating and packing. Ceramics industry is anticipated to witness significant growth over the forecast period. It was valued over USD 3.5 billion in 2014 and it is expected to exceed USD 5 billion by 2022. The surge can be attributed to proliferating automation in production units. Asia Pacific is projected to exhibit highest growth owing to the rapid industrialization in the region. China pneumatic conveying systems market size was valued for over USD 1,400 million in 2014 and it is likely to reach USD 2,260 million in 2022 growing at a CAGR of 6.2% from 2015 to 2022. India was valued over USD 777 million in 2014 and it is predicted to reach USD 1,240 million by 2022 growing at a CAGR of 6.1% over the forecast period. Europe pneumatic conveying systems market size was over USD 6 billion in 2014. It is estimated to have considerable growth due to governmental regulations for sanitary operations. The region is anticipated to hold the considerable industry share of more than 30% in 2014. Key industry players in pneumatic conveying systems market share include DongYang P&F, AZO GmbH & Co. KG, K-Tron, Cyclonaire Corporation, Gericke, Atlas Copco, Nilfisk, Nol-Tec, Pneu-Con, Dynamic Air, Flexicon Corporation, Vac-U-Max and Schenck Process.